This species is native to southern Europe, the Madeira Islands, the Canary Islands, northern Africa and western Asia. A very widely naturalised species, that is particularly common in the southern parts of Australia. It is common in New South Wales, Victoria, southern and western Western Australia and the southern parts of South Australia. Scattered populations are also found in south-eastern and central Queensland, in Tasmania, in other parts of South Australia and in the southern parts of Northern Territory. Also naturalised overseas in the UK, tropical Asia, New Zealand, southern USA (i.e. California, Texas and New Mexico) and the southern parts of South America. Primarily found in warmer temperate and semi-arid regions, but also a weed of sub-tropical and arid environments. 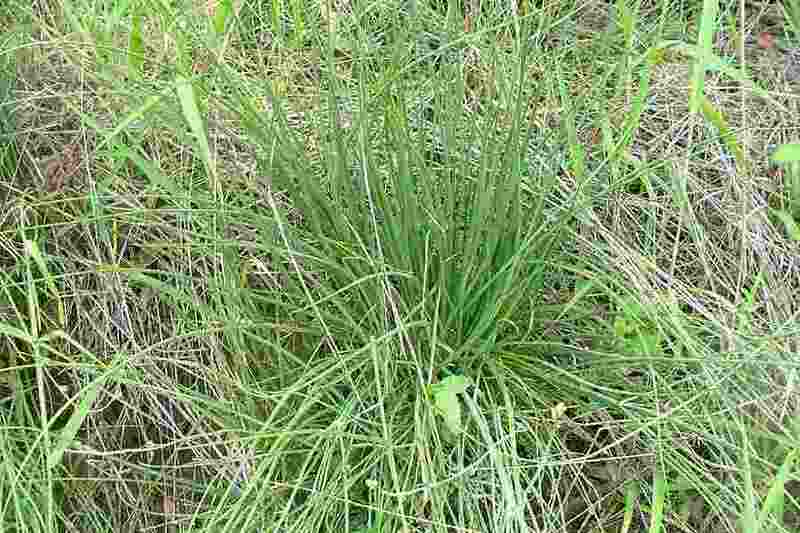 A weed of pastures, rangelands, open woodlands, grasslands, shrublands, roadsides, railway lines, disturbed sites, waste areas, coastal environs and cropping areas. An upright (i.e. erect), tufted, herbaceous plant with stems growing 20-80 cm tall, but usually less than 40 cm in height. It can be either short-lived or long-lived (i.e. annual, biennial or perennial) depending on the environment in which it is growing. a tufted herbaceous plant usually less than 40 cm tall. 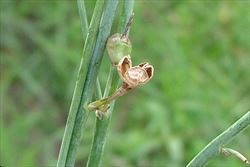 its onion-like leaves are hollow, cylindrical and elongated in shape. its flowers are alternately arranged along the branched upper parts of its smooth and hollow stems. 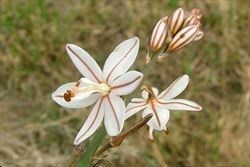 these flowers (15-20 mm across) are white or pinkish in colour and have six 'petals', each of which has a reddish stripe down its centre. its almost round capsules (4-7 mm across) have three compartments, each of which contains one or two dark-coloured seeds (3-4 mm long). The upright (i.e. 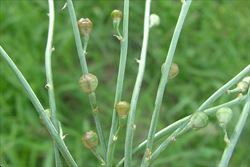 erect) flowering stems are smooth, hairless (i.e. glabrous) and hollow in nature. These stems (2.5-7 mm thick) are rigid, do not have any leaves, and are usually branched in their upper parts. The elongated (i.e. 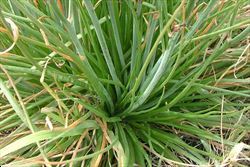 linear) leaves all emerge from near the base of the plant, giving it a tufted, grass-like, appearance. 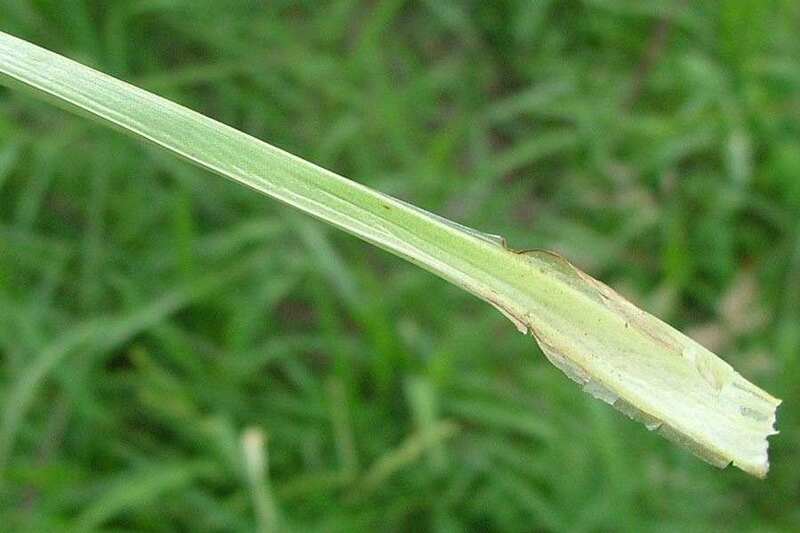 These leaves (3-55 cm long and 1.5-8 mm across) are almost cylindrical in cross-section (i.e. terete), hollow, slightly fleshy (i.e. semi-succulent), and have an onion-like appearance. They are hairless (i.e. glabrous) and significantly shorter than the flowering stems. The white or pinkish coloured flowers (15-20 mm across) are borne on short stalks (i.e. pedicels) 1-9 mm long. Up to 30 of these flowers are alternately arranged along the upper parts of the branched flowering stems (i.e. they are borne in terminal racemes). The flowers have six 'petals' (i.e. 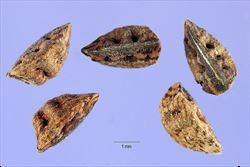 tepals or perianth segments) that are 5-12 mm long and 1-3 mm wide, each of which has a brownish, reddish or purplish-coloured stripe down its centre. The flowers also have six stamens (6-7 mm long) with white filaments and orange or brownish-coloured anthers. Flowering occurs during winter, spring and summer, although most plants do not flower in the first year of growth. The fruit is an almost round (i.e. sub-globular) capsule with a slightly wrinkled (i.e. rugose) appearance. These fruit (4-7 mm across) are divided into three compartments, each containing one or two seeds. They turn from greenish to pale red-brown or sandy-brown in colour as they mature. The seeds (3-4 mm long) are brown or black in colour, spindle-shaped (i.e. fusiform) or triangular in shape, and have a rough surface texture. 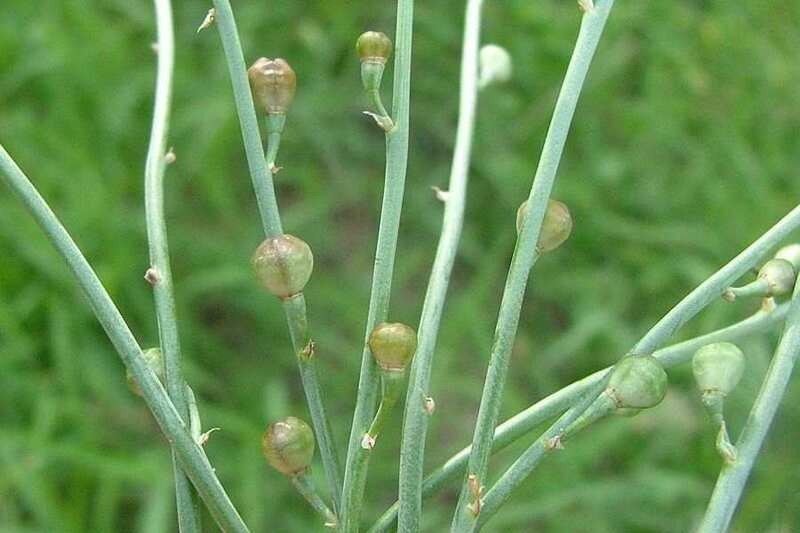 This plant reproduces by only by seed. Seeds may be dispersed by wind, water, machinery, in agricultural produce, and in mud attached to animals and vehicles. 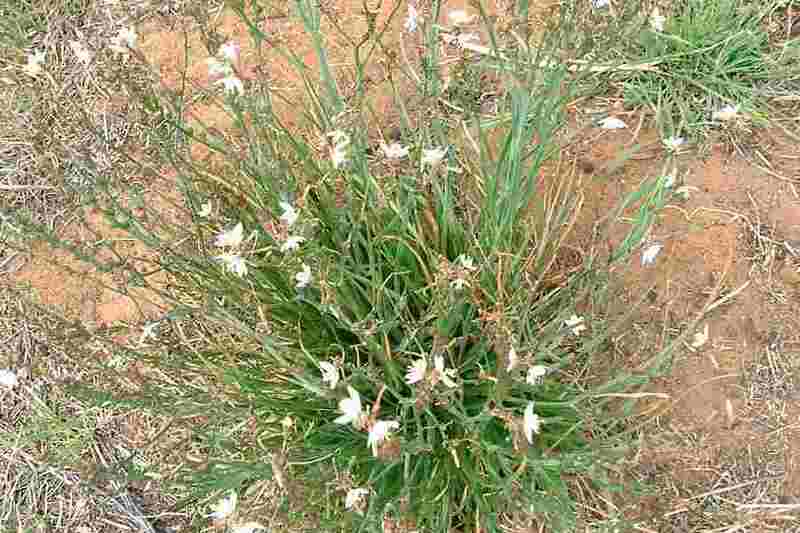 Onion weed (Asphodelus fistulosus) is regarded as an environmental weed in Victoria, South Australia, New South Wales and Western Australia. 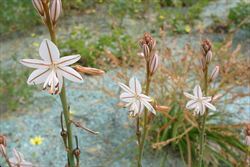 During a recent survey, onion weed (Asphodelus fistulosus) was listed as a priority environmental weed in three Natural Resource Management regions. 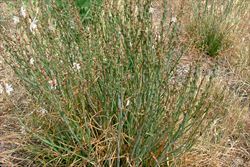 It is particularly abundant in disturbed sites, along roadsides and in overgrazed rangelands but also grows in a wide range of native habitats. For example, it has been observed to invade relatively undisturbed open woodland communities as well as dry coastal vegetation, mallee shrubland, lowland grasslands, grassy woodlands and rocky outcrop vegetation. Dense infestations of this species grow so thickly that the cover of other vegetation, particularly grasses, is reduced. These infestations eventually lower soil nitrogen levels, preventing other plants establishing and competing with this species. 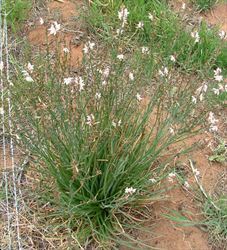 Onion weed (Asphodelus fistulosus) is so abundant in the Flinders Ranges National Park, in South Australia, that it attracts tourists when in flower and is commonly mistaken for native wildflowers by visitors. 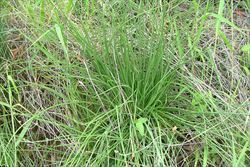 In northern New South Wales it has been observed growing among dense stands of Coolatai grass (Hyparrhenia hirta), another environmental weed, and it is present in Kinchega National Park in western New South Wales. 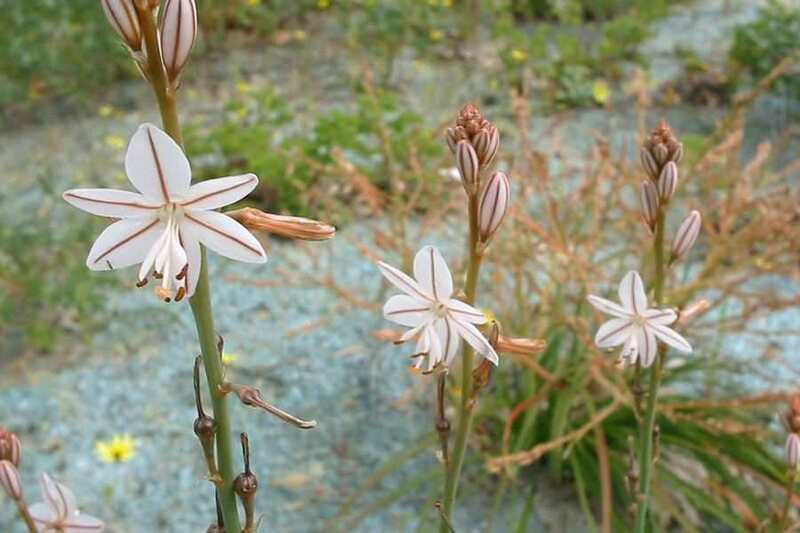 In the Cape Range National Park, in north-western Western Australia, there are infestations of onion weed (Asphodelus fistulosus) growing in the gorges and on the coastal plains. In Victoria it is thought to pose a serious threat to one or more vegetation communities (e.g. 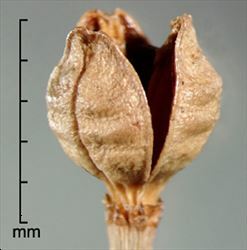 it has a high impact on riverine chenopod woodlands in the Murray Scroll Belt bioregion). 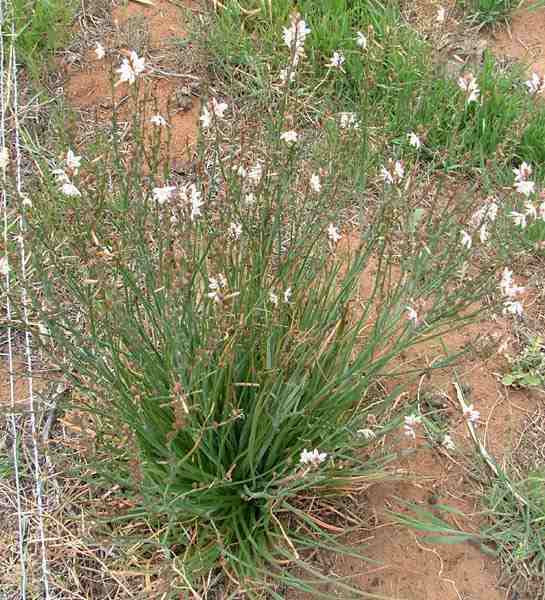 Livestock refuse to eat onion weed (Asphodelus fistulosus) and it therefore tends to become invasive in grazed areas, competing strongly with other more palatable pastures species. This can result in a reduction in the productivity of pastures and increased management costs. 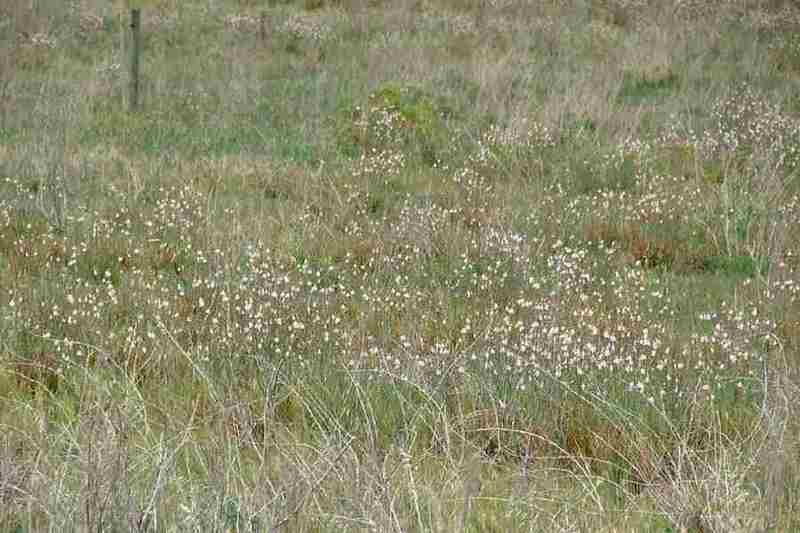 It has even been been suggested that the carrying capacity of much grazing land in the drier parts of southern Australia has been reduced by 75% because of this weed. 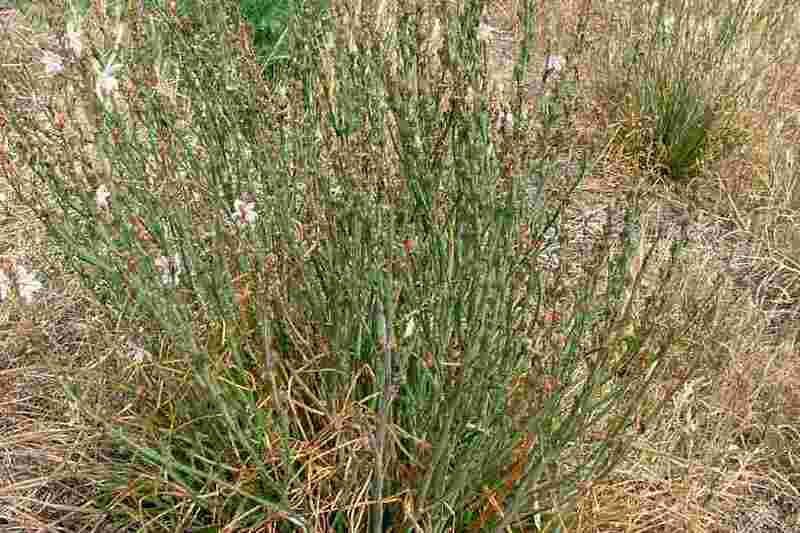 It is also found in cropping areas, though it is less of a problem in cultivation than it is in pastures. However, infestations growing in fallows can cause significant blockages in tyned implements such as scarifiers and cultivators. New South Wales: Class 4 - a locally controlled weed. 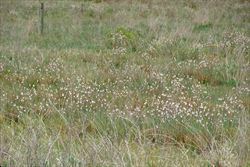 The growth and spread of this species must be controlled according to the measures specified in a management plan published by the local control authority and the plant may not be sold, propagated or knowingly distributed (in the Balranald, Berrigan, Conargo, Deniliquin, Murray, Wakool, Wentworth and Windouran local authority areas). South Australia: 7* - A Class 7 weed, the control of which is only required in part of the state (i.e. in the Coorong, Goyder, Lacepede Tatiara Robe, Lower Flinders, Mid Murray, Upper North, and Yorke Peninsula control board areas). Victoria: C3 - a regionally controlled weed in the Glenelg, Corangamite and Wimmera (in the shire of Northern Grampians only) regions, where landholders must take all reasonable steps to control them and prevent their spread on their land and the roadsides which adjoin their land. the Western Australian Department of Agriculture and Food Farmnote on this species, which is available online at http://www.agric.wa.gov.au. 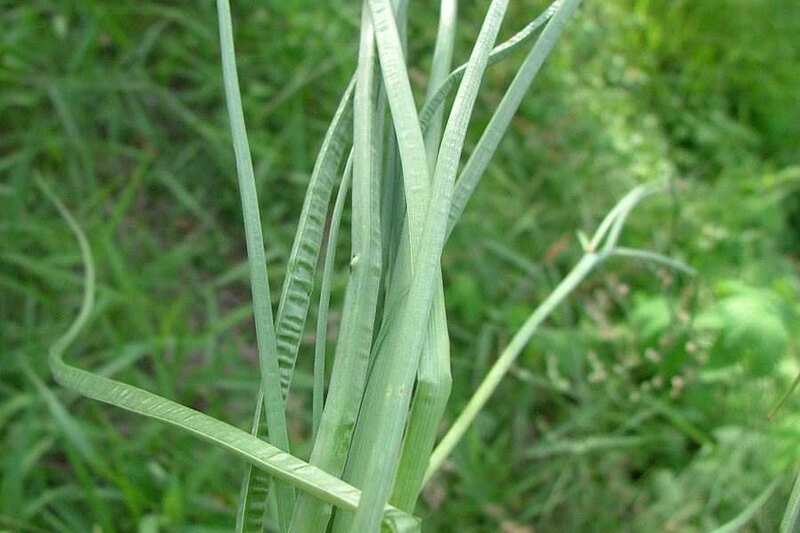 onion weed (Asphodelus fistulosus) has cylindrical, hollow, leaves and produces flowers that are borne along its thin, cylindrical, few-branched stems. These flowers have a reddish stripe running down the middle of each 'petal' (i.e. perianth segment). 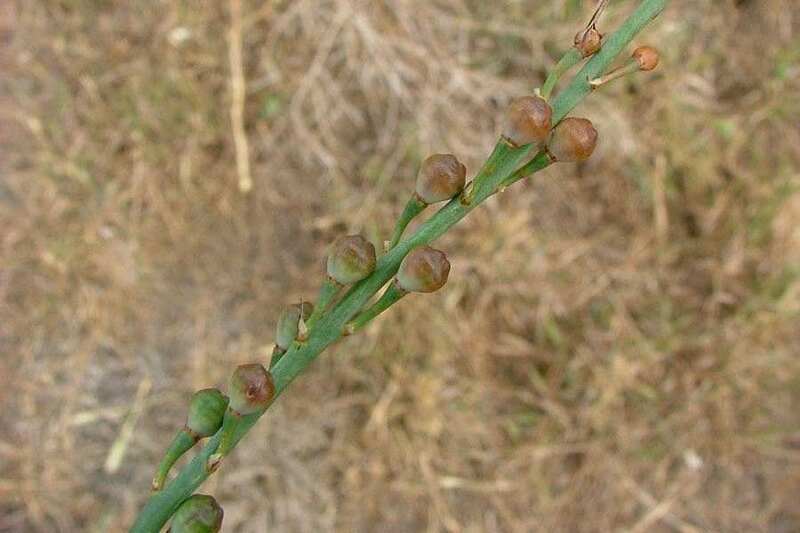 dune onion weed (Trachyandra divaricata) has flattened, hollow, leaves and produces flowers that are borne along its cylindrical, much-branched stems. These flowers have a reddish stripe running down the middle of each 'petal' (i.e. perianth segment). 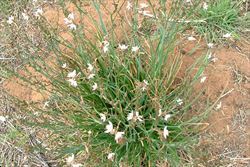 false onion weed (Nothoscordum borbonicum) has flattened, strap-like, leaves and produces upright flowers that are borne in clusters at the top of its thin, cylindrical, unbranched stems. These flowers sometimes have a reddish or greenish-coloured stripe running down the outside of each 'petal' (i.e. perianth segment). three-cornered garlic (Allium triquetrum) has flattened, strap-like, leaves (with a 'keel' running down one side) and produces drooping flowers that are borne in small, loose clusters at the top of its three-angled (i.e. triquetrous), unbranched stems. These flowers have a green stripe running down the middle of each 'petal' (i.e. perianth segment). 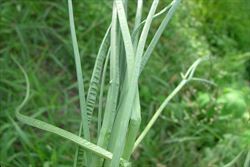 crow garlic (Allium vineale) has cylindrical, hollow, leaves and produces dense clusters of flowers (and/or bulbils) at the top of its thin, cylindrical, unbranched stems. These flowers are white, pink, or greenish in colour and do not have a stripe running down the middle of each 'petal' (i.e. perianth segment). 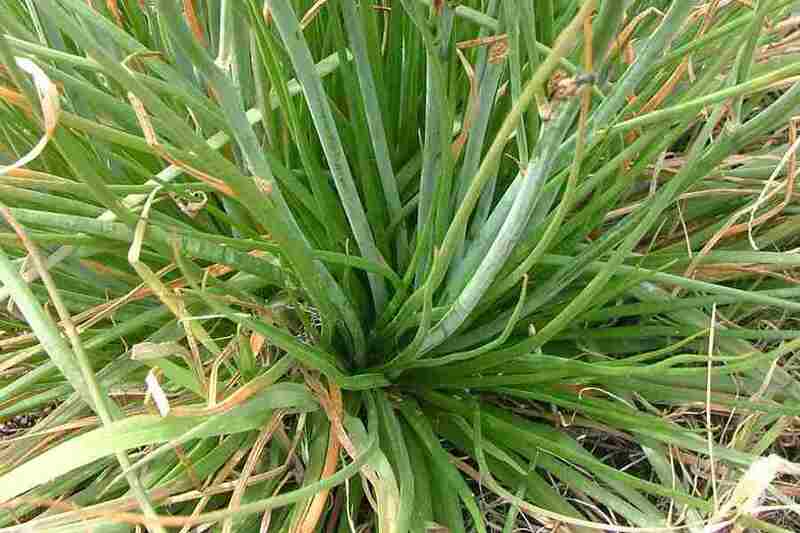 Onion weed (Asphodelus fistulosus) may also be confused with native leek (Bulbinopsis semibarbata). However, this species can be readily distinguished by its smaller golden yellow flowers (up to 15 mm across).